I need to echo the sentiments that I posted after my last race 2 weeks ago. I finished!! What a tough race this was. 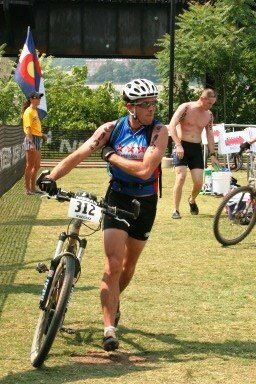 And not because of the same issues that I had at the ACE Xterra, but because of the technical riding and the weather. It was a typical east coast summer day, hot and humid! 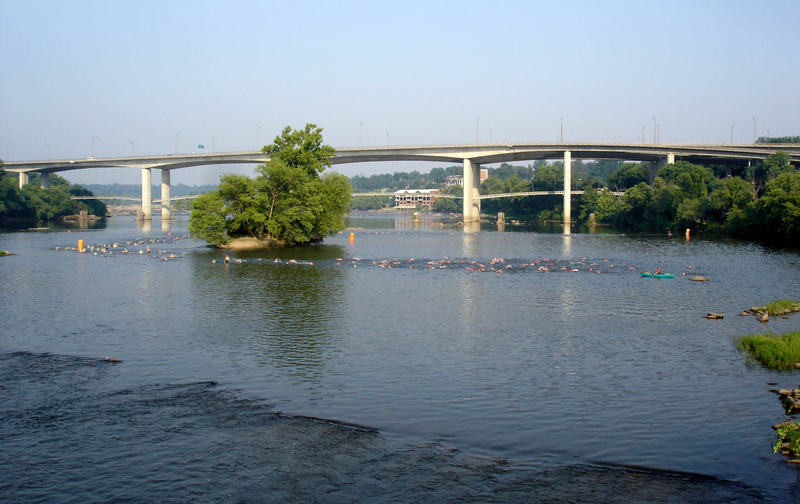 I met some other DC Tri Clubbers early on Saturday morning so that we could all caravan down to Richmond. We wanted to get out of DC early so we wouldn't have a lot of traffic and so that we could enjoy some time in Richmond. We wanted to get all registered for the race, get our bearings at the race headquarters, go for a nice swim, and ride a bit of the course. This seemed like a nice way to spend the day. It started out pretty well. 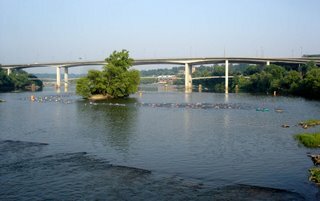 We got our race packets, found out the details of the swim, then went down and jumped in the river for a little warm-up. 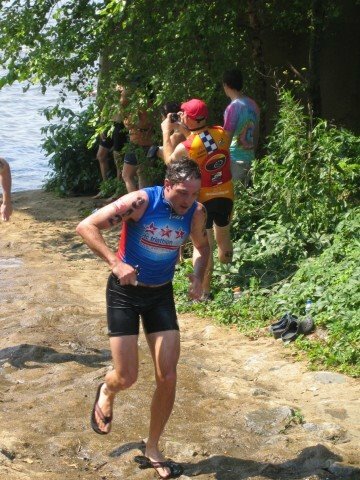 I felt pretty good in the swim, but there were only a few of us out there, and we swam a short course. Then it was time to hit the rope swings under the old railroad bridge. At first, this seemed like a great idea and it was fun! But the stakes were raised and so was the starting elevation for the swing. Here's where my brilliance comes into play. I decided to do it JUST ONCE MORE... Whenever those 3 words are mentioned, nothing good ever comes. This time it came in the form of a sprained pinky finger. Fortunately, I don't use my pinky all that much, so it was ok. But it could have been the ice I put on it that afternoon. After swinging, 3 of us decided to have some lunch before we were going to head out on the bikes to check out a bit of the course that I hadn't seen. It was a pretty hot part of the day when we headed out to the trail, but it would be hot on Sunday, so we figured it was good to get used to it. I was really glad to get out and check out the last part of the course, but it was definitely longer and more technical than I thought. So it took a bit out of us, not a good thing the day before the race! We survived though, just a bit more tired that we should have been. After riding, I needed to check into my hotel, shower up, and then go meet some people at an Irish bar to catch the second half of the Italy-USA match. It wasn't a win, but I think we were all happy about a tie. Then I went back to my hotel to nap for a bit, since I was up way too late on Friday night and headed to Richmond early on Saturday. After that I met some people at a restaurant downtown for a good pasta dinner. Most of the people that I was with were doing the Sport race, which was earlier than the full Xterra, so we called it an early night. Which was fine by me since as I mentioned, I needed sleep. I got all my stuff organized for the race the next day and then watched the end of the Stanley Cup game 5 I think. I woke up in time to grab a snack and then head down to the river to watch the Sport racers start the swim and then come into transition for the bike. I saw everyone that I was looking for just as they were entering the transition area, Brian, Matt, Heather, Liza, and Ted. They were all looking good too!! Now I had to scoot back up to my hotel, check out, and then get down to set up my spot in transition. As I was laying out my shoes and things I saw a couple friends who were racing the full with me, Tucker, Frank, and Andy. It was about 10:00 in the morning and getting hotter by the second. I headed to some shade for a few minutes before it was time to head to the river for a quick warm-up and the pre-race meeting. The order for the start was to send the pro's off first and then the under 35 group. All of us in the white caps headed down into the water after the pro's sprinted off and we waited for the cannon. I glanced around, sizing up the competition and got a bit nervous, so I moved a little further up-river to get a better angle with the current. I had swum the river twice before, so I pretty much knew what to expect, but I had heard that the level was a little lower. Off went the cannon and away we went. 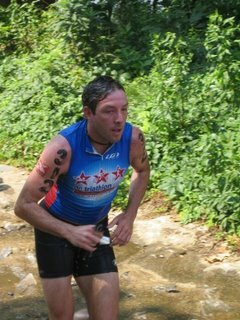 This was the first time in any of my races that I felt comfortable with the swim from the get-go. My stroke wasn't exactly what I had been practicing, but I wasn't concerned since I was feeling good. Because I was feeling good and comfortable, I might have gone out a bit faster than I should have, but it was ok, because I felt good. Even if I slowed a bit at the end and my time wasn't that great. Next came the adventure of getting out of the water and up to transition. As I was almost in to shore, I hoped up and started wading out of the water, catching my foot on a rock. That was just the beginning of an ungraceful swim exit. The "boat ramp" where the swim starts and ends is not very smooth. It has large rocks embedded in the concrete. 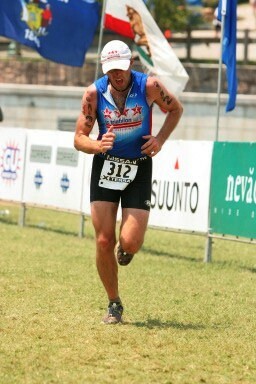 This cause problems when I slipped on my flip flops to run the 1/2 mile to the transition area. As I was doing that, I tripped a few times, but luckily didn't fall! Fortunately I was told that I didn't have the worst balance, so I felt better. On the run up, I heard some people cheering for me, so that was nice! I spent a bit too long in this transition and I am not exactly sure why. As always, it took a while to get my shoes on, and then my camel back, and have some gu, and etc. I feel like I lost some time there, but oh well, I was all set, grabbed the bike and headed off for the ride. I went out on the bike with just a few others right near me. We crossed over the bridge and headed on to the gravel section and we spread out even more. 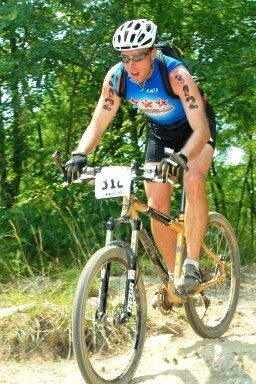 I was feeling glad to be on the bike, but I wasn't feeling 100%, probably due to the ride on Saturday. 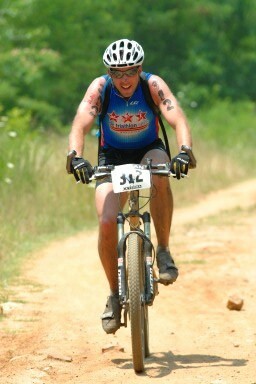 They had added some new single track to the course from when we rode it the weekend before, which was cool. Eventually we got to one section where it was a long stretch of gravel. I was cruising along when a group of riders came up on me. There is drafting allowed in the race, so I jumped on the end of the train and was able to cruise to the stair section. Yes, I said stairs!! 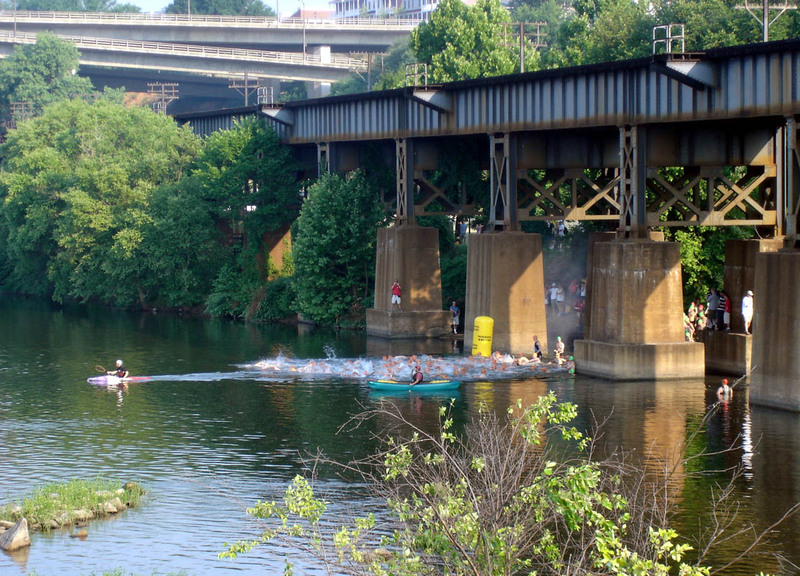 There are several sections on this course, since it is in the CITY of Richmond, where you have to go up and down some stairs to get over the railroad tracks. We all walked up the stairs and this is where the technical loop splits off from the sport course. At this point I was behind a bunch of people. Half of them were fast and took off and the other half I was able to follow pretty well. Eventually I was able to go around a number of people and make up some time, even though I wasn't feeling really good on the bike. I also had some faster people pass me. But overall I felt good, even if my stamina was wearing down as the miles ticked off. Down some stairs, down the gravel road, and back up some stairs, then we were off on the next technical section. I was definitely feeling rough, but looking forward to getting back to transition. There were 2 spots that gave me problems on the trail back toward the transition. The first was a pretty steep ramp up the side of a hill that was just built to add some single track to the course. I probably could have made it, but the guy I was following struggled, so I had to jump off my bike or I would have gone down. Oh well, I'll get it next year! Then, right at the end of the trail, there was a steep hill with loose sandy dirt that I lost my balance on and went down, unfortunately I had people behind me. I think this was mostly due to the fact that I was worn out, because I made it up fine on our pre-ride. But I was really glad to see the transition area shortly thereafter. I jumped off the bike at the dismount line and immediately my left quad began to cramp up. It was so bad that I had to limp my way back to my transition spot. I was really worried about how I was going to be able to complete the run! I took a few minutes to rest and try to let the cramping subside. By the time I got all my bike stuff off and get ready for the run, my cramping had almost gone away. So off I went out on the run. After a few hundred meters, my cramping was gone, and I was able to concentrate on figuring out how to make it all 6 miles. The run was probably the most trying part of the whole race. Over half of it was in the direct sun and it was mid-day by the time I was out there. I continued to say to myself over and over that I was only out for a little jog. I just kept putting one foot after another foot. I am not sure how many people passed me, but it was definitely a lot. At this point in the race, I wasn't worried about what place I was going to come in, I just wanted to make it through the run and cross that finish line. There was one crazy part of the run that was called the "Mayan Ruin." It was a 75 to 80 foot tall hill that was made up of railroad tie steps, all varying heights. I took this very slowly, but I was still winded when I got to the top. Eventually we got out of the direct sun and into a bit of trails. The last half of a mile was across the suspension bridge and up the hill to the finish. Just as I got to the bridge, I began to cramp up again. So close to the end... 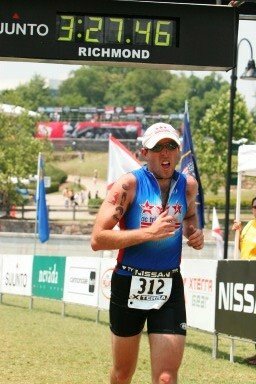 I just pushed through it and boy can you see the pain on my face as I crossed the finish line! Once I had crossed the line and took a deep breath, I looked up at my time and could not believe what I had seen. I finished a lot faster than I was expecting, based on the way that I felt during the race. I think that I could have done a bit better if I had some salt tablets or electrolytes to help me. Or if I hadn't pushed my legs the afternoon before the race. But I definitely felt some improvement over the ACE race 2 weekends before, and I will be even better at the Rocky Gap race in a few weeks. I was 16th in my age group and missed getting 28 points (the 15th place) by only 35 seconds. My overall position was 175 out of 263 competitors. A pretty good day at a tough race. This was a fun weekend with some good friends and I am looking forward to doing it again next year. The second time on a race course is always better than the first! There was a pretty good article in the Richmond Times-Dispatch Here is the write-up from the Xterra people about the race. Thanks! 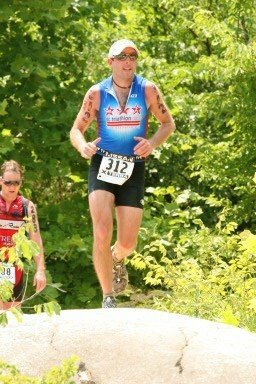 It was hell while I was going through it, but now I look back on it as a fun race! Do you run with my running fool friend, Baby Bananas? I am not a good runner. I would like to just hang around wearing the outfit and drinking spiked Gatorade, though :)! I don't run with Baby Bananas, I think she is too good for me!